Processions have long been a form of liturgical prayer. Processions to and within sacred sites, especially the Temple in Jerusalem, marked numerous festivals in Jewish prayer, and many of the psalms were composed to accompany such processions. As an example, the Talmud describes processions on the seven days of the feast of Tabernacles, during which the people would process around the altar with willow branches, singing a litany that included Psalm 118:25 as the refrain. St. Basil (d. A.D. 379) in the East and St. Ambrose (d. 397) in the West provide some of the earliest references to liturgical processions in the Catholic Church. Both state that these processions had been practiced for many years, accompanied with sung litanies. Public processions with the Blessed Sacrament became popular only when Jesus’ real presence in the Eucharist was questioned. For many centuries this sacramental reality was taken for granted, but in the 11th century an archdeacon named Berengar of Tours — who taught in the cathedral school of Chartres, France — was said to question the Eucharist’s real presence (though historians disagree on whether he actually denied the Real Presence, it is accepted that Berengar questioned transubstantiation as a description of the change that occurs when the bread and wine become the Body and Blood of Christ). Overt denial of the Real Presence in the Eucharistic species came with the Protestant Reformers. Theologically, processions remind us that we are pilgrims journeying through this earthly existence following Jesus on “the Way” (an early title for the Church). In the Eucharistic processions of Holy Thursday and the solemnity of the Most Holy Body and Blood of Christ (Corpus Christi) we publicly proclaim this truth, following the Lord physically even as we pledge anew to do so spiritually. We also give public witness to our acceptance of the Lord’s words: “The bread that I will give is my flesh for the life of the world” (Jn 6:51). 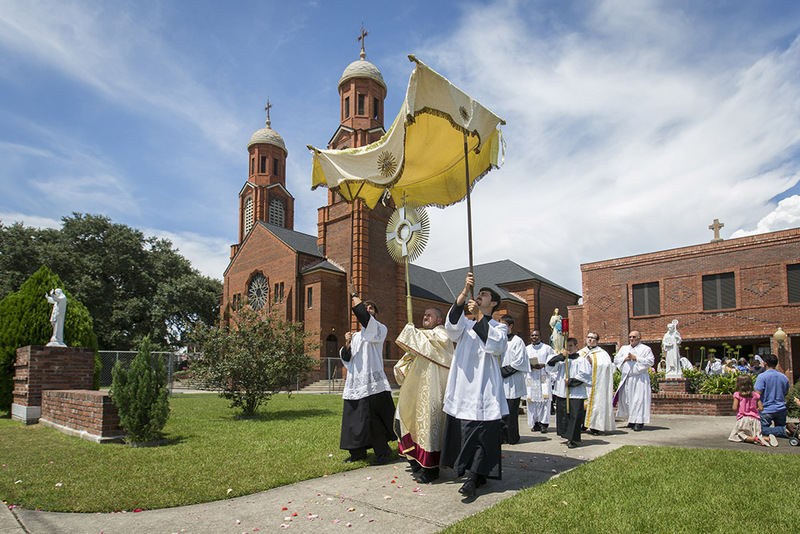 As such, public processions serve as tools of evangelization within our neighborhoods.